Satre said: „Hell is other people“. In IT it’s frameworks and added abstraction layers. We all got familiar and comfortable with symlinks to folders, where we store our different TYPO3 versions and a nicely layouted backend where you choose your extensions. Lately you even get proper hints on pop-up windows, what an update of an extension is changing and whether it has breaking changes or not. Why? Maybe the core team assumes that the world is full of people who have to setup 10 instances of TYPO3 every day and they are just fed up of creating symlinks and loading four to five extensions with each new website. Here at zazu.berlin we don’t have these kind of problems since we are not captured in a conveyor belt kind of website production. We are dedicated to get the best structure and form for every customers business, so setting up the basic skeleton of a website is also a time span of adjusting the mind of the integrator to the journey that is in front of him. It’s a warming up where things usually go nice and smoothly. It’s like putting your players on the field, before you start the game. Composer uses a setup file in the json-format in which you list the TYPO3 version you want plus all it’s dependencies, including the extensions (normal extensions and the system extension) you intend to use. In order to get a working TYPO3 setup, the starting composer.json also involves two typo3cms scripts that will create the typical folders and files of a working TYPO3 environment. The idea is, that you can trim your personal TYPO3 setup to the system extensions you really need and skip the rest. If they are not enabled – in the old setup – system extensions don’t take a lot of space and if a disabled system extension is a real security isssue, I would doubt. The second idea is, that every extension is bringing it’s own composer.json that will then take care of the dependencies of the respective extension and the depending other extensions will then bring their own composer.json who will then take care of that dependencies … and so on. For me the question is, why should I automate processes that are easily done step by step, when I get such a load of things to take care of, only to have a one click installation and a one click „composer update“. For me it feels like a bad deal. And additionally I have more scripts to debug and possible wrong or outdated parameters. „FIRST_INSTALL“ was managed and adjusted by the core team, the composer.json is my playground for searching misspelled names. And who on earth knows exactly what every system extension is doing and which of them I don’t need to have on the server since this is also a field of change. In the end most of the time people will just go for the whole lot of system extensions, as they did before. Go to your linux home directory and change the ownership of the file „.composer“ that – since we used sudo for apt-get – also has only root rights and root ownership. Composer is using this folder for cache files and needs the right to write in it. You can also run composer with a „sudo“ in front but then all execution files you create will get root rights. This of course is a security issue! In March 2019 you still get a warning about using „mso/idna“. This is fixed in the next TYPO3 update – for now just ignore it. If you get a warning about using composer in root mode or that the folder „.composer“ is not writable, just repair it, as it is described above. TYPO3 minimal – what is minimal? Minimal is something that doesn’t work. Surprise, surprise, we don’t want things to be too easy. You should definitely raise your hourly wages after this! public is the destination folder for the server and holds also TYPO3! vendor holds additional software like typo3fluid (not the extension), and some other stuff like symphony. TYPO3 is just in the destination folder of the web server (here „public“). If you like to join the discussion, why and for what reasons, see link below. The composer.lock file holds the whole process that was done on your server by composer. At the top of the file you will find a link to more explanations. But for the time being this file is not important. So this is what it says: minimal. Composers home is https://packagist.org/ everything is expected to be there. This means that all extensions from the TYPO3 repository should move – for the time being as a second home – to packagist with a vendor name (the company/person who made it) and an extension name e.g. helhum/typo3-console or typo3/cms-form. For the time being there is a workaround for extension which are not on packagist by using the vendor name: „typo3-ter/a-typo3-ter-extension-that-is-not-on-packagist“. You must replace underscores through dashes: „tx_something“ is referred to by „tx-something“. And you must add the Repository: „https://composer.typo3.org“ to your composer.json, so composer knows where to search for these extensions. Since TYPO3 8.7.10 you can use a concept, called „subtree split“. It will be mandatory for TYPO3 9. The concept means, you will not copy the full TYPO3 core package, including all system extensions, you will never use. But only install what you really want. You will not be able to install typo3/cms:^9, but have to name each system extension. And we would get a complete installation in a new folder called „CmsBaseDistribution“. But the recommended way is to setup your own composer.json and travel with it from installation to installation. You only have to make sure, that it is directly in your web directory. name: any name for this setup in the syntax „vendor/name“. If it is an extension it would be „vendor/extension-name“ and used to refer to it! 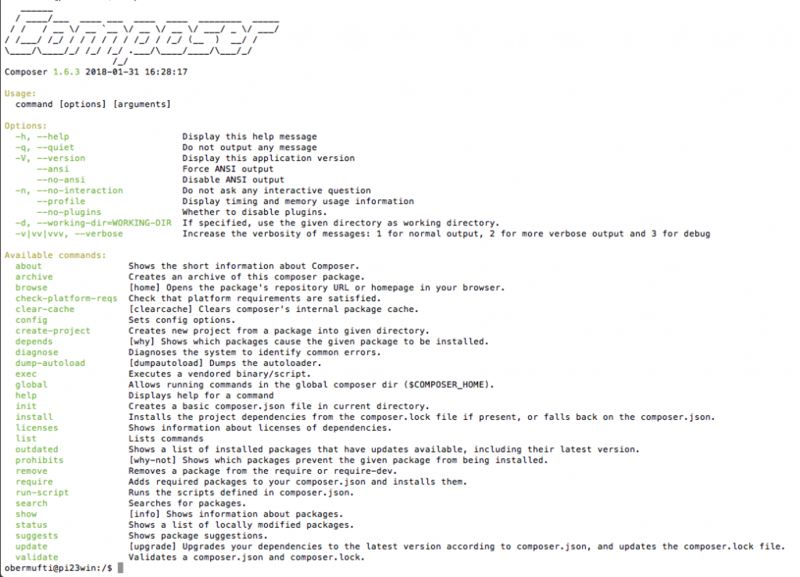 require: this is the command „composer require …“ this is where it’s happening – get the stuff you need! The syntax is vendor/name so for an extension this should be consistent. For a project the name is not essential, since this is the starting point and from here you refer downwards to the extensions with their vendor/name marker. Remember every extension has it’s own dependencies and it’s own composer.json file. So from a project type you go downwards. Composer can only use the PHP version that you are executing it with. So if you run it on the command-line, it doesn’t know anything about the PHP version that is in the web context. If you install dependencies using a different PHP version than the one that serves your application, you can tell Composer about that version explicitly using the platform config. But you still need to make sure that the PHP version used to install dependencies is compatible with any scripts that are executed afters (or run install with the --no-scripts option). My test showed, that using the platform.config setting it is still creating an error when the command-line php version is lower then the expected php-version of the server. I didn’t test yet, what happens if you skip platform.config. This refers to my sitepackage extension on bitbucket – called „zazupackage“ – using the version-control-type „vcs“. In the require-section you then need to tell composer which level (stable, dev …) you want and witch branch of your version control. dev-master: take always the newest version of my master branch. This command will add the corresponding line to your composer.json and you will avoid to make typos. You see above, that we started with typo3/minimal and then added what we need. In my case almost everything what was always there. I didn’t dig into every sysextension yet, so I just take the whole lot (no „subtree split“ yet). There is still no Localconfiguration.php and no established database connection. Calling the public folder with a browser will guide you through the rest of the installation process. You have to create a FIRST_INSTALL and put it in the server root (folder „public“). You should also check whether all web folders have the rights needed and the respective owners of the server process, otherwise you will get a nice white clean page with nothing on it. Create a page and a template record. Don’t forget to include the static templates of the extensions, including the sitepackage. Extensions are now managed by composer. 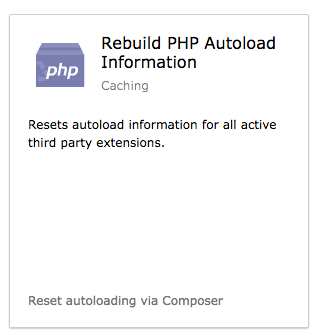 Autoload has to be reseted by composer. In my case I rely for my sitepackage extension on „typo3/minimal“ and e.g. „reelworx/rx-shariff“. You see that the rx_shariff version for TYPO3 is already on the packagist repositroy with the vendor name „reelworx“. „autoload.psr-4“ is what we did in old times, when we added an extension in the backend after loading it from the ter. 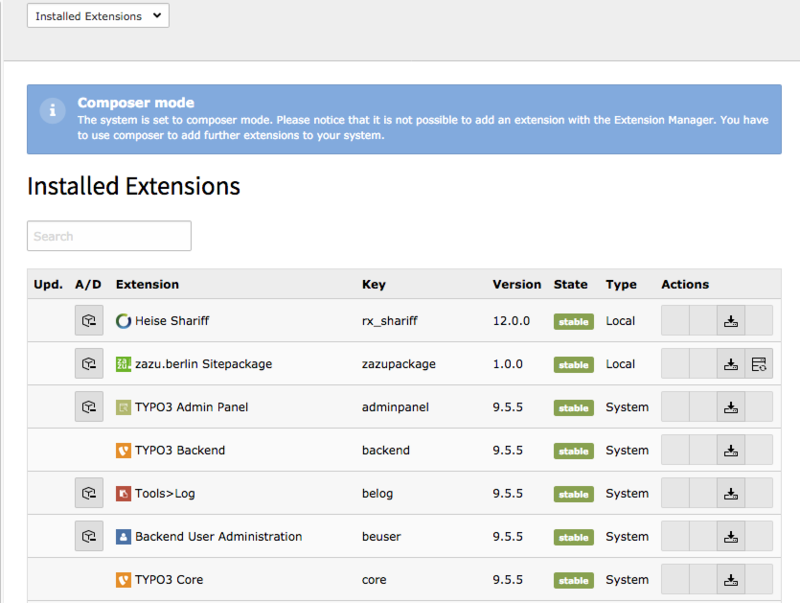 In the TYPO3 Backend you will see a warning, that the extension manager is no more the place to manage extensions. 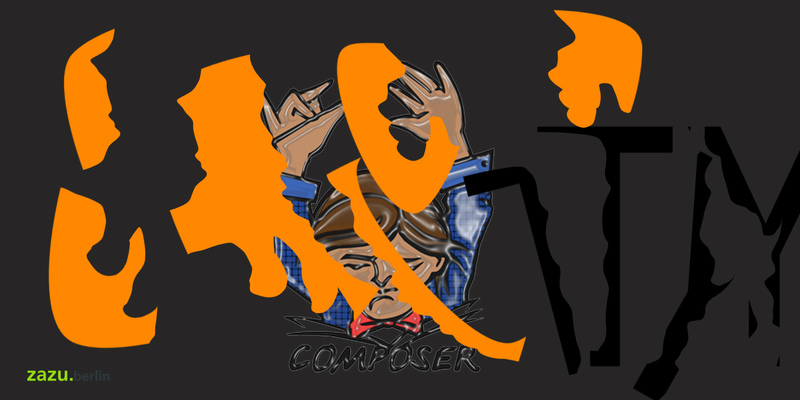 Everything has to be done by „composer require typo3/cms-xxxxxxx:^9.5.0“ and „composer update“. Also the „dump-autoload“ command is now in the hands of composer (composer dump-autoload) and no more executed by the admin tools. TYPO3 6.2 was still delivered with a couple of different autoloaders, that all had different approaches and rules to find a class. This led to the naming conventions in and outside Extbase and the optional ext_autoload.php file to load classes that didn’t follow the conventions. Since TYPO3 7.0 all this is gone and there is only a single autoloader left, the one of composer. No matter if you run TYPO3 in composer mode or not, TYPO3 uses the composer autoloader to resolve all class file locations. Dieser Artikel ist in Englisch, nicht um Ihnen das Leben schwer zu machen, sondern um den Autoren weltweit etwas zurückzugeben, die mir auch tagtäglich mit ihren Artikeln helfen!